The following are watercolors that I am making in the month of June, 2013. Rather than post a painting a day (which is not only tedious but unrealistic provided my working hours), I will post a series for the month, or half-month depending on the volume of work produced. After an extended break from copying the Met's collections, I have now turned inwards and am using painting as a means of knowing the Self, essentially a physical manifestation of mediation. This piece is inspired by recent events and books that I have read. Two of the biggest challenges that I have faced, probably in my entire life, is staying grounded (being present, realistic, logical, responsible, practical) and speaking up for myself. I don't know why, but this last one completely paralyzes me. Telling someone what I really feel is more terrifying than encountering a barking pit bull with a frothy mouth in my front yard. Why is this? Some people I know just love telling you how they feel all the time. In fact, their (seemingly) high self-confidence borders on annoyance. I've always held my deepest feelings inside, especially when they are potentially upsetting for the other person. But wouldn't I want to know if I'm doing something totally off-kilter? I think I would. So lately I've been taking baby steps in speaking up for myself, often to the chagrin of those around me...if you are the target of this, thank you for your patience during this awkward growing phase. You are my guinea pig! The image of the person with the tree as a head and four legs comes from the book Eat, Pray, Love by Elizabeth Gilbert, whose life path I relate to (more than I'd like to admit). The image symbolizes someone who thinks with her heart (not her worrisome head) and who remains so grounded in the earth it is as though she has four feet, not two! The blue circles on the throat symbolize the throat chakra, which is the energetic center of the body which deals with speech and its negative (lying or withholding) and positive (speaking the truth) energies. Gilbert's more recent book Committed is a thought-provoking essay exploring the institution of marriage. As a woman, I found this second book particularly enlightening and recommend it to anyone who is considering (or not considering) tying the knot in this society. 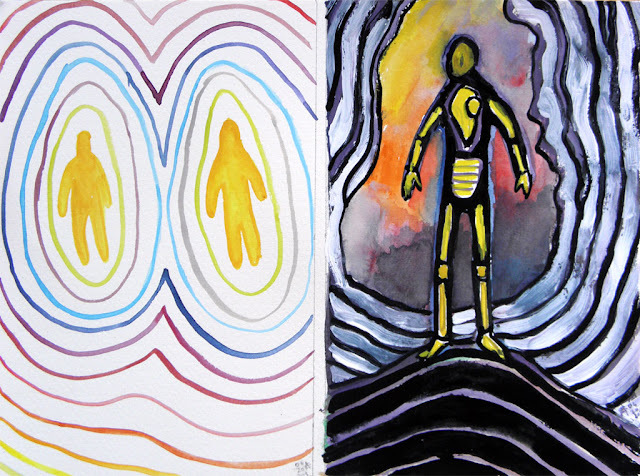 These pieces are inspired by an aura reading that my mom's friend Lou gave me at my high school graduation party. She used the same colors as the image on the left and one of them means that I will be a teacher. I forget what the other colors mean. The piece on the right is based on a conversation I had with someone about finding my inner self whom I continuously block out/run away from. This is the 10% of me that I am getting in touch with. The black and red outline is the membrane that keeps me locked in and the stars represent sleep, unconsciousness, as I am often unconscious. The yellow inner figure is the part of me (like the tip of the iceberg) that is conscious. Now she is locked inside and my job is to reacquaint myself with her. I painted this while listening to an Italian grammar podcast. 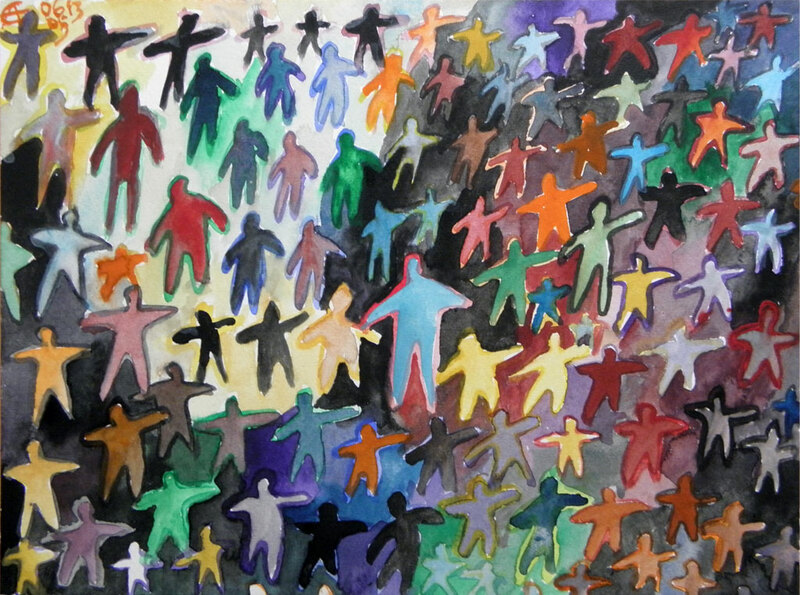 The figures represent to me either all of the people I know/encounter or the many facets of my own personality, with the largest central figure representing the Self. When I am confused and doubtful, anxious and unsettled, I often experience feelings of depression or hopelessness. Last night while setting out to paint, I felt so angry at everything and nothing seemed to work. 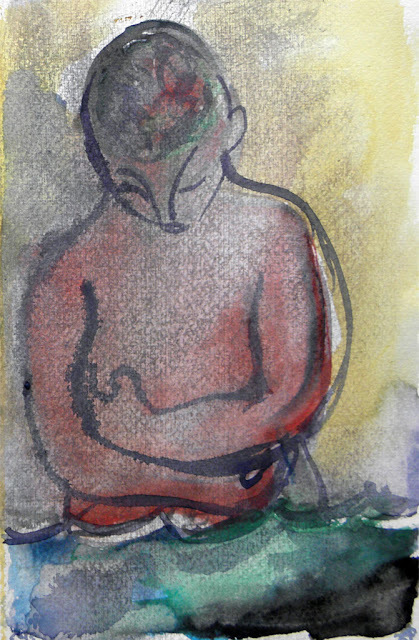 A reoccurring image of a female holding herself in the ocean fixed itself in my mind, and I painted it several times until it felt time to move on. The swirls in the head represent to me anxiety, depression and the overall cloudiness of the mind during these states of being. 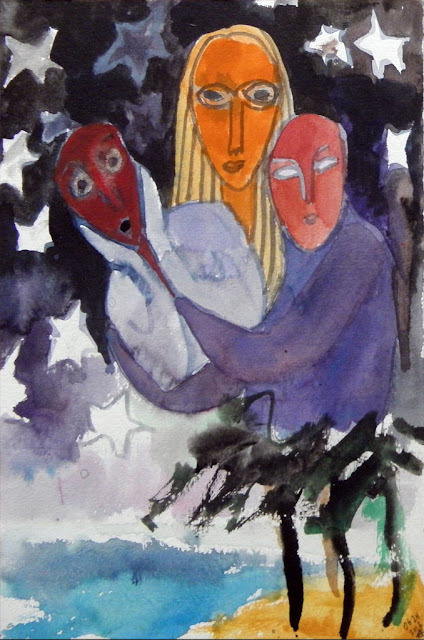 This watercolor is a bit clearer than the previous one, although it shares a mood of ambiguity. The scissors are wielded by the Self (me, or anyone) and are cutting out the Inner Self (conscious, all-knowing, wise part of the Self) as if it were a dress pattern. The eyes represent the Soul or the person looking out through the Body, and are inspired by a set of inlaid shell and precious stone eyes from the Greek section of the Metropolitan Museum of Art. The woods represent a peaceful abode, a place of refuge from the city and the chaos of urban life. The little yellow person in the box is the Inner Self which I (and many of us) have locked away in ourselves, preferring to remain unconscious than to face the terror of knowing who we truly are. The horse stands for childhood and freedom. The outline of the person holding herself stands for fear, depression, giving up, feeling overwhelmed. The red mandala could stand for the layers of the person (physical, spiritual, ethereal, conscious, unconscious, super-conscious). 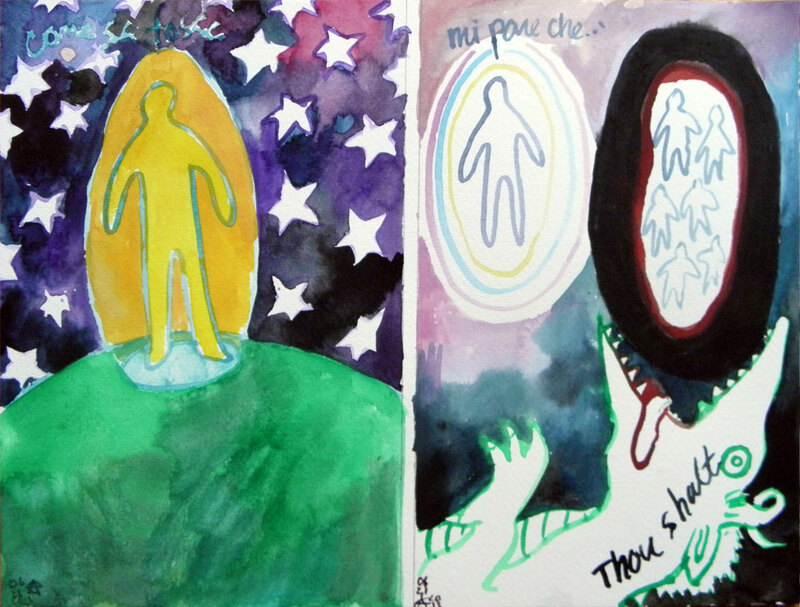 The piece on the left (Guilt/Shadow) was inspired in part by a particular dream of choosing a lover. In the dream, I was presented with Channing Tatum and James Franco. Although up to this point in life I had liked neither (one simple and handsome, the other bizarre and arrogant), in the dream, I unreservedly chose Channing, leaving poor Franco in the lurch. Upon waking, I immediately consumed a Vanity Fair article on Channing, whose cover featuring the hunky actor I had scoffed at just the night before, learning now that he's not as one-dimensional as I had thought. Is the universe teaching me humility? Or perhaps it is reflecting my priorities in relationships; I prefer a hunky yet genuine and likeable guy without a Doctorate in physics to the socially awkward triple-Master achieving cocky renegade. 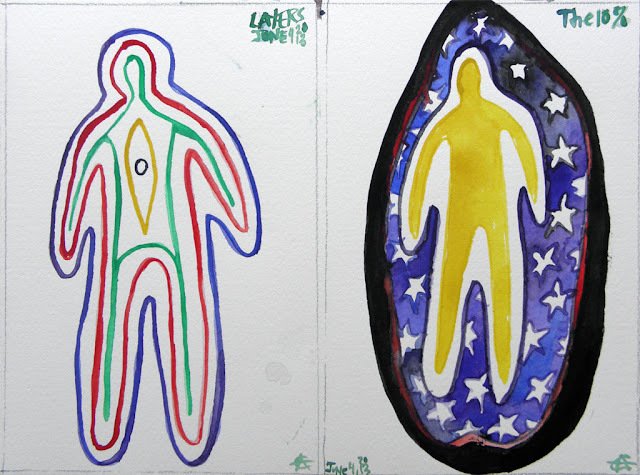 On a deeper level, one could examine the two characters as two parts of the self. My constant high achieving, resume building, degree pursuing, vanity producing years may have earned me merit and prestige but not happiness. Perhaps it is time to give in to the Channing side: the happy-go-lucky part of myself that follows my instincts towards a heart-felt success, in whatever form that may take. To wit: dropping out of college to dance strip clubs, leading to a successful modeling and movie career, which is bigger and probably more stable than Franco's will ever be. The other parts of this painting deal with the shadow side of the self (read any psychology book), and a proclamation that guilt doesn't work on me anymore. Lately I've been discovering how many of my relationships are fostered and clung to out of guilt. Take out the guilt and see what's left: yourself, true friendships and peace of mind. 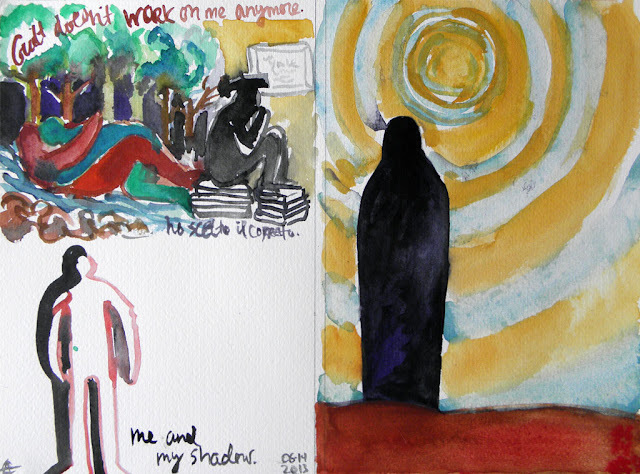 The right panel is a vague image of a woman in a desert, swallowed by the sun's pulsating rays. She may be wearing a burka, or perhaps she is a symbol of something. I really don't know; the image just came from my head. I really enjoy these two pieces. The one on the left (La Gelosia) is about, well, jealousy! The idea is that I (or the jealous person) is holding a whole bunch of gold coins, not using them out of fear or suspicion. Others on the margins are using their coins freely: performing tricks, sharing them, playing with them. I stare at them with envy. How come they can display their coins, demonstrate their skills and get love and attention? I covet their freedom, their openness, not realizing of course that I have the means and the ability to do the same! It's as if I have forgotten about my own coins guarded so closely against my chest, the coins I am deathly afraid of surrendering. The piece on the right is about the season of love, or la stagione dell'amore. Below the amorous couple, a heart with a human face in it rests peacefully. Pensa con il cuore, the writing reads. Think with your heart. The sideways third eye represents psychic ability or intuition, which is a guiding force in thinking for yourself and not letting worries or outside influences sway you. 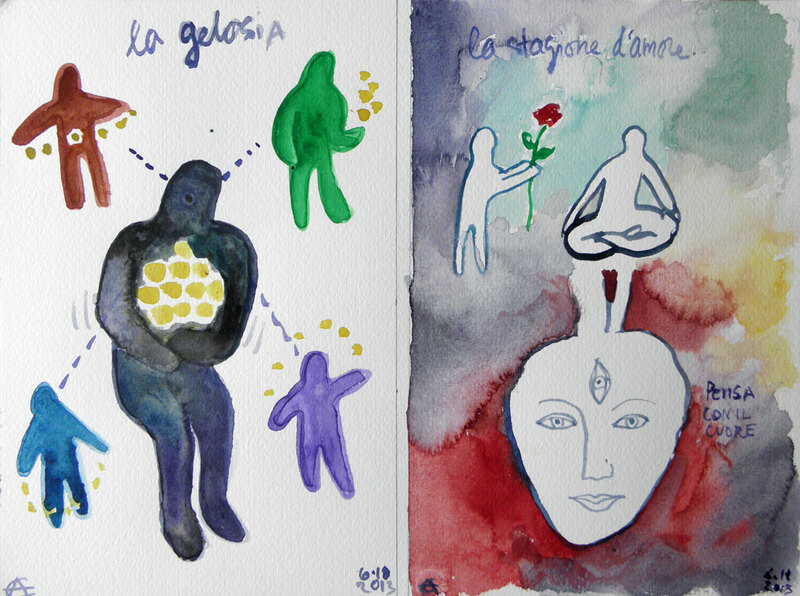 These pieces follow up on earlier works (La Gelosia from June 18 and The 10% from June 4, 2013). The piece on the left, Guarding the Light, depicts a person carefully holding a golden asset of herself. This asset could be a special quality of herself, an energy or a power that she is ready to share with others. A counterpart to the jealousy piece, in which the person fearfully clings to the assets while envying those who play with theirs freely. 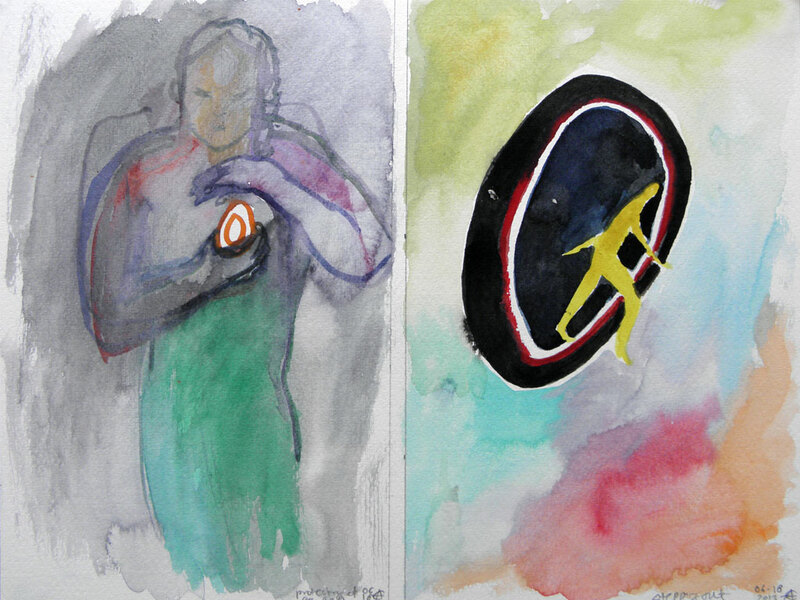 The piece on the left, Stepping Out, is a continuation of The 10%, in which the person was living in a cocoon of anger (red) and fear (black). In this piece, the person gingerly emerges from the shell, as if to test the waters in a hot tub before stepping in. 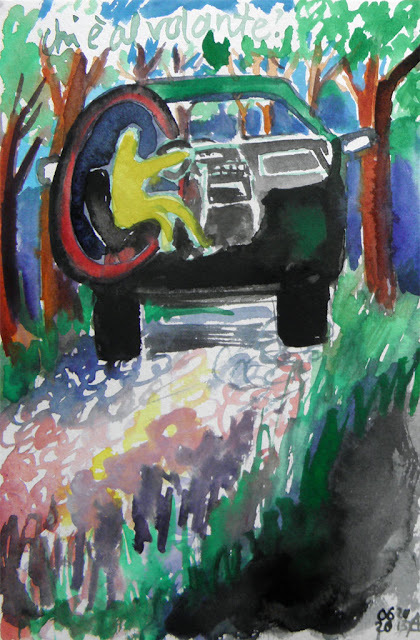 This piece asks, "Chi e' al volante?" Or, "Who is driving?" In my experience, when I experience fear, my guard (symbolized by the now familiar black and red circles) immediately goes up and I react out with anger (red) or more fear (black). Driving a car is a metaphor for steering one's own life. So, who is steering the car? Is it the inner, tranquil and wise part of me (the gold figure), or is it the cocoon of fear and anger? In the image, the gold figure is reaching out of the cocoon to steer the car, although the figure is not completely free of the protective casing. 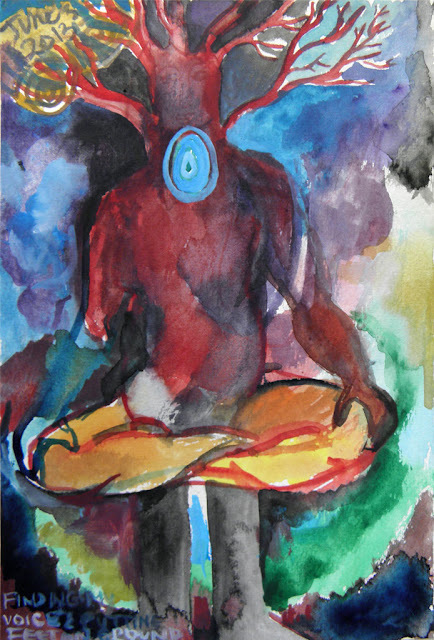 As in the other images, while the anger and fear help the golden figure feel safe, in reality it shields the figure from genuine experiences and sharing the "golden qualities" with others. I painted this piece last night after a lovely evening with my Uncle Jeffrey. The image of the golden figure surrounded by gold and a cool blue came to me yesterday morning at work. I had been wondering how to replace the black (fear) and red (anger) shells around my golden one and also how to protect myself, say, at my work which requires interaction with thousands of people a day. The notion of imagining protective shell around oneself is not a new one; people have been telling me to put one up for years, but I do so only intermittently. It is extremely helpful in cases when one is the object of projection, conflict or unwanted attention. The protective shell creates a boundary between oneself and the outer world, not in an isolationist manner, but rather with an aim of keeping oneself in tact in any environment. 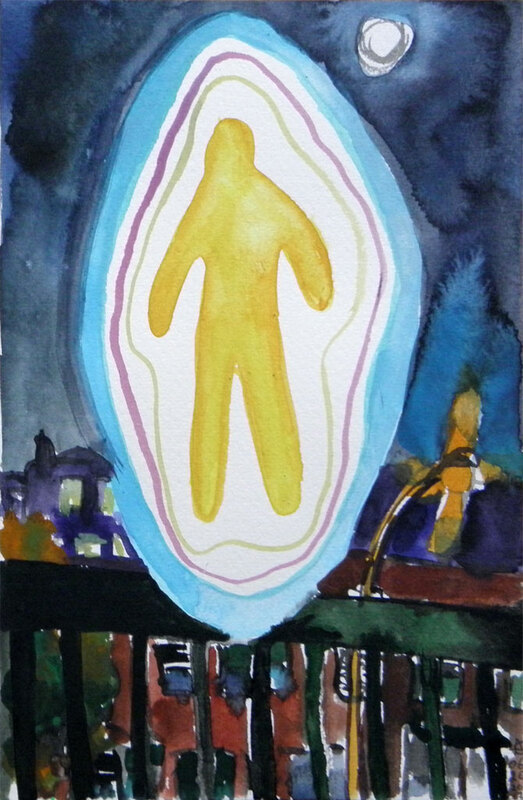 This image depicts the golden figure hovering in the protective shell over the nocturnally-lit street, the moon aglow. The piece on the left Couple explores the ability of two entities co-existing in their appropriate spheres. On the right, Building My Bones can be seen as a metaphor for my psychological self-reconstruction. Mi Pare Che came first and is inspired by a piece in the early European galleries at the Met depicting a saint swallowed by a dragon (specific details to follow). The dragon in this case, is named Thou Shalt, originating in a story retold by Joseph Campbell in the moving interview, The Power of Myth. For me, the words "Thou Shalt" reference all the rules in the Bible, the rules and restrictions put upon ourselves that originate in fear or obligation. In this watercolor, the figures to the right are encased in a black (fear) and red (anger) cocoon, about to be swallowed by this dragon. The figure floating on the left lives in a different color scheme and is thankfully free from the impending carnage. Come Se Fossi conveys my feelings of separateness, from family, from acquaintances, from the general public. As in: Did I drop off from another planet or what? Perhaps this is attitude is healthy, but it can be easily self-destructive if one tries to mold oneself according to others' dictations. This is me in shock based on something I heard. The two people or beings behind me are comforting me. One looks like a wiser version of myself (both have red faces and purple bodies). He or she props me up during this time of transition, gazing at the viewer benevolently. The female figure with a face resembling an African mask looks on knowingly, finding humor in the situation. 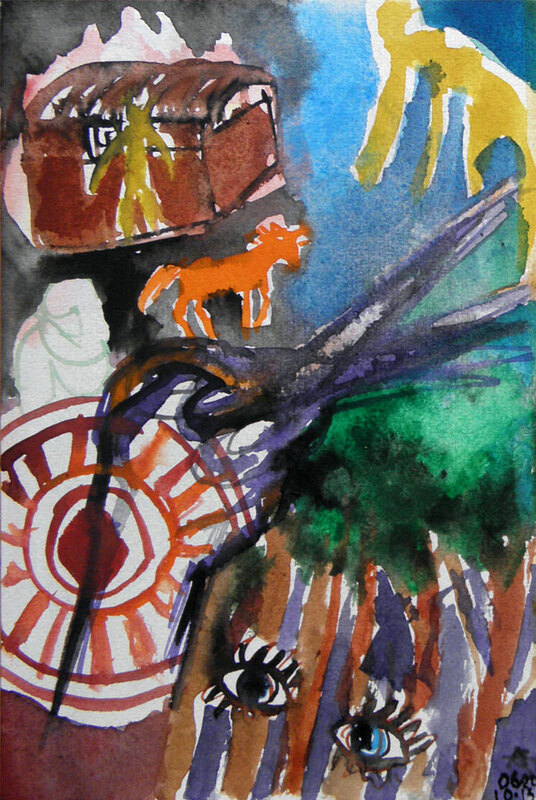 The beach below recalls a watercolor series made during a visit to Brazil in 2008. This summer, I would like to be there.